Ferry at 6:30 pm, so I had time to check out Juneau, Capital building, Alaskan brewery, Glacier and a couple of good eating experiences. Big question for Juneau is, Why would you have a sport motorcycle if there are only 40 miles worth of roads? Ate at Costa's Diner, who is more than likely a relative from my Italian roots. For those of you who don't know I use Brad Costa as my artistic name, movies, writing and music which is my mother maiden name. My family roots are from the Venice area, which was the same area as Collette Costa the diner owner. Oh, and she also has an amazing singing voice, which makes one of us. After Breaky went to the capital building. Totem pole outside of the museum. $15 to go in a museum the size of a house, so of course I didn't go. Went for some free sample at the Alaskan brewery, which is great beer! 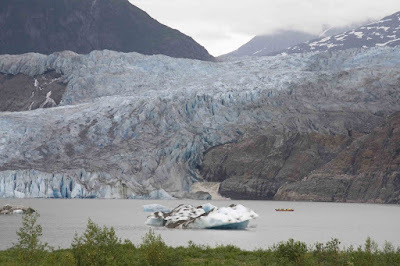 Then I made my way to the Mendenhall Glacier. Check out the size of the 20 man boat to the right of the floating breakaway. Interesting experience at a Thai restaurant before getting on the Ferry. Basically I went in to get some rice and veg as I had been eating burgers and fries all the time in the USA. The girls at the counter were shy, but when the boss lady saw the bike they all became very friendly. The Thai Boss lady came out to talk to me at my bike getting one of her girls to bring an ice coffee or something loaded with milk which I had to turn away. She continued to inquire about my journey telling me that she had family in Toronto to which I replied I just got back from Thailand. After a bit more story she demanded my email and I gave her my website too (hope they check it out). Before I left she took me in the kitchen to say hi to everyone including her son that thought my bike was really cool. Picture me waving to 10 Thai people in a restaurant kitchen all stopping what they're doing in order to greet me. What a situation, I kind of felt like a rock star. Absolutely, I(the cook from the Thai kitchen) have checked your website out and showed people in the kitchen. It's interesting and very cool. I am usually the one who updates your story for them (people in the kitchen). Everyone quite enjoyed it. We're glad that you made home safely.